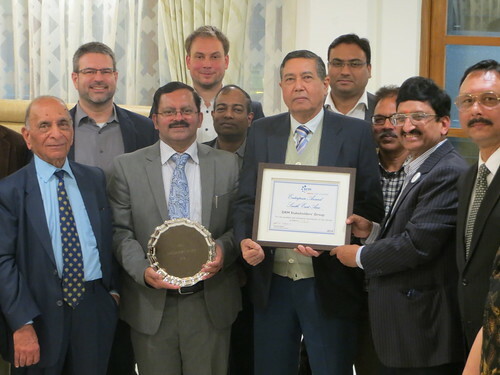 All India Radio (AIR), the public service broadcaster in India, has adopted the international DRM (Digital Radio Mondiale) standard for the digital terrestrial radio transmissions in the MW and SW bands. DRM allows for multiple FM-like radio services plus associated data such as multi-lingual news articles to be carried in place of or as an extension to the former analogue radio services, while maintaining the large-area service coverage of the AM bands. 35 MW transmitters of AIR, of power ranging from 20 kW to 1000 kW, continue to operate in DRM – 2 of these in pure DRM and 33 in simulcast. 25 of these are working in pure DRM daily for one hour. 2 SW transmitters are also carrying services on DRM. Two more transmitters, 100 kW each, are under trial in Delhi and these are expected to be operational in a couple of months. In June (5th and 6th) All India Radio in Delhi has tested the newly installed 100 kW SW transmitter in DRM. The schedule was: 0400-0630 UTC (0930-1200 IST) on 9950 kHz beamed to South India (Pure DRM, Channel A – Urdu Service, Channel B FM Rainbow). In a recent tweet AIR welcomed the fact that the organisation has begun to appear in the media with good news “about the reduction in the receiver cost apart from the portrayal of the astounding features of the technology”. One of the welcome features of the current roll-out of DRM in India has been the early and overwhelming commitment of the car industry, which is already equipping new car models with default DRM radio sets at no extra cost to the customers – even before the official launch of the DRM services by AIR. 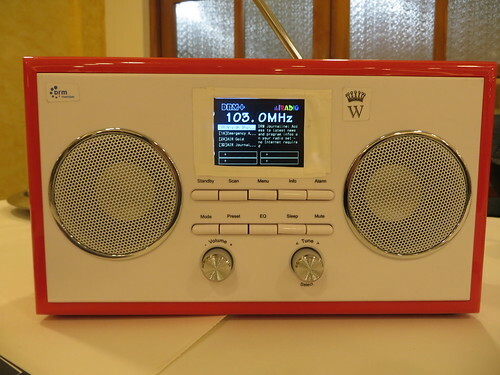 Keeping pace with the digital radio developments, the automobile receiver industry in India has invested millions of dollars in the domestic development of DRM digital radio capable receivers and chipsets. It is pleasing to see that the roll-out of DRM equipped cars is growing rapidly with each month. 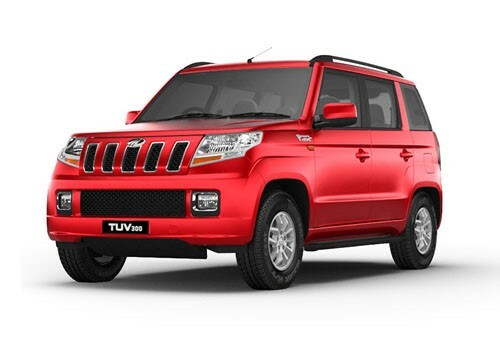 By the end of 2017, this number was estimated to be about 500,000 (5 Lakh) cars, while as of the beginning of May 2018 the volume has already surpassed 800,000 (8 Lakh). Hyundai has built-in DRM radios in all its models except one. 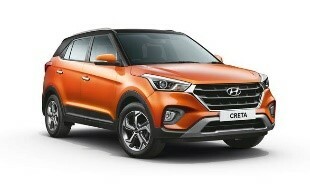 Their latest model with built-in DRM receiver just launched is called Creta and is one of the most popular and best-selling SUVs in India. Maruti Suzuki has also incorporated DRM receivers in 6 models (three of them pictured below) and all their models are expected to have built-in DRM receivers by the end of December 2018. Most of the leading car manufacturers have either already incorporated DRM receivers in their cars or are in the process of incorporating them. The increase has been spectacular in comparison with similar digital radio roll-outs in other established markets in the world. Indian listeners benefit already from the domestic car industry’s joint effort to provide the in-car DRM functionality as a line-fit option for new models without charging the consumers any extra cost. In comparison, other digital radio markets around the world have taken decades to reach this level of commitment by the automotive industry, which for the most part expect car buyers to pay extra if they want to enjoy digital radio. 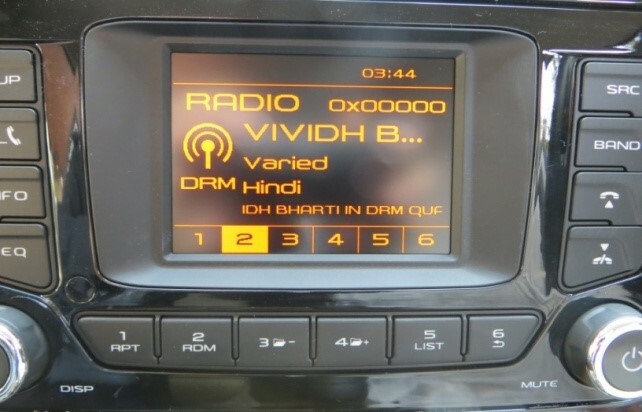 Radio consumption in India is driven by listening in cars, which explains the paramount importance of the early-on commitment of the Indian automotive industry to DRM for the ongoing success of India’s digital roll-out programme. In the domain of standalone DRM radio receivers for consumers there has been an increased activity especially in the past 12 months. 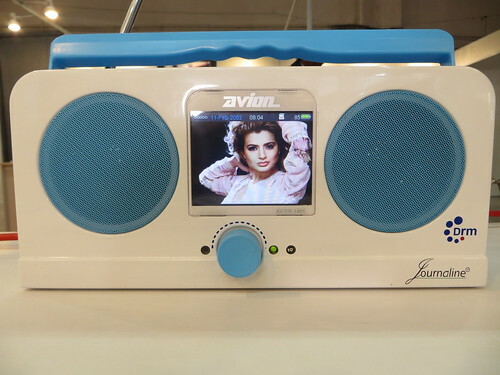 Communications Systems Inc. (www.avionelectronics.in) is the first radio manufacturer in India to domestically develop and produce a DRM receiver (AV-1401), an ambitious full-featured digital radio. It offers a colour screen display, stereo speakers, built-in chargeable battery with 10-hour capacity on full charge, external power source connection, detachable remote control, recording and playback from an external source and a full-fledged media player for all types of digital content. 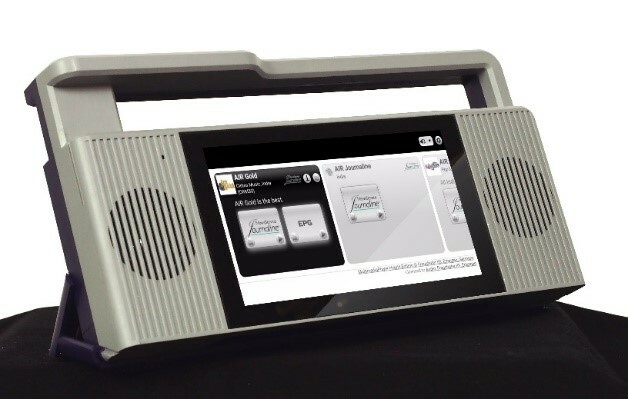 In terms of digital radio reception, it supports all the DRM-specific features including Journaline advanced text and Emergency Warning Functionality (EWF). As part of the company’s continued commitment to DRM in India, the model was recently updated and easily meets DRM’s minimum receiver requirements as recommended by the DRM Consortium. Enhancements through the newly improved model include superior sensitivity, enhanced support for Emergency Warning Functionality (EWF) with provision to switch on the receiver automatically on EWF alarms, even from deep-standby, and a bigger and improved LCD screen. The upgraded unit can receive AIR DRM signals of both the transmitters in Delhi in very good quality even inside the buildings. The company is in the process of supplying AIR and has received orders for export to Australia, too. 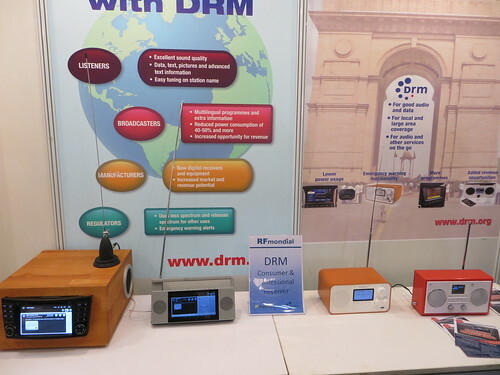 More Indian companies are also in the process of designing/developing DRM receivers. Inntot Technologies (www.inntot.com), a young start-up enterprise in India, who has already won CII Industrial Innovation Award 2017 and several other awards, has developed a software-based DRM receiver, which is based on a generic processor. It also meets all the specifications for the Minimum Receiver Requirements, supporting all DRM core functionality such as Journaline advanced text and EWF – Emergency Warning Functionality. The design has been field tested in number of cities in India. It is expected to be very cost effective. Recently it was announced that the Software Defined Radio (SDR) startup Inntot Technologies has raised about $0.5 million (Rs 3.3 crore) in its seed round from early-stage venture capital firm Unicorn India Ventures for developing DRM receiver solutions and other digital radio products. 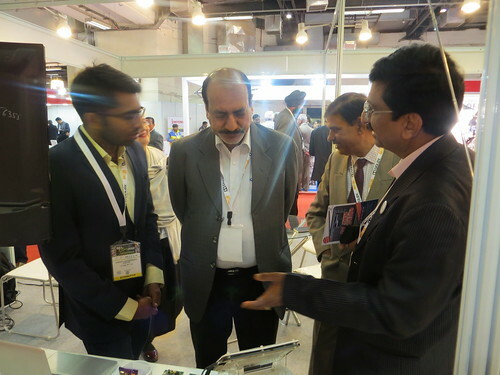 “The USP of our solution is that it runs on generic hardware thus making it an affordable solution for the OEMs. 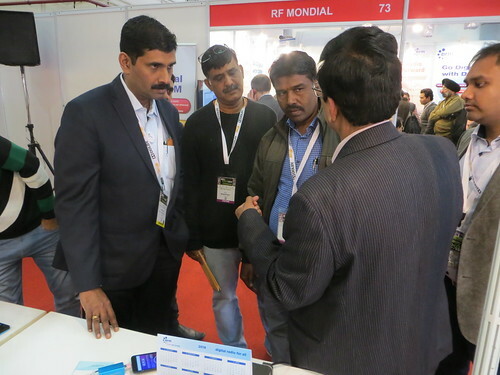 We are also exploring the mobile phone segment to use our SDR solution for radio reception,” declared to the Economic Times of India Rajith Nair, cofounder, Inntot. The company is open to collaboration for its projects and for the manufacturing of their solutions. While the first models included solutions for DRM in AM, provision for DRM in the FM band is also planned to be incorporated in the unit by end of July 2018. GeekSynergy, another start-up company in India, which has been given awards by the President of India and the Karnataka Government, is working on the development of a highly affordable yet full-featured DRM receiver, which is likely to be showcased by summer 2018. The company is also working on incorporating DRM into smartphones using one of the most well-known chips installed in all the branded mobile phones. Gospell Digital Technology Co Ltd located in China (www.gospell.com) has presented a very well-reviewed DRM Receiver, GR‑216, which is already in production. These units can receive DRM signals in the AM as well as the VHF bands for large-area and local services, respectively. Core DRM features such as Journaline advanced text and EWF – Emergency Warning Functionality – with automatic device-wake-up from deep-standby are supported. The company is marketing their units on Amazon and also receives direct orders. The model has obtained CE certification for international distribution including to Europe. In addition, Gospell is developing a DRM receiver dongle, GR-227, which can be plugged in the existing audio systems in the automobiles on USB ports or Aux input to receive DRM signals. The receiver model will allow legacy cars already on the road and with analog AM and FM reception to be upgraded to DRM digital reception through this simple add-on device. The unit is likely to go into production shortly. Titus SDR (www.titusradio.com), a Panamanian based company, has developed a multi-standard and software-based digital radio receiver, supporting DRM in all bands (LW, MW, SW, VHF bands I, II, III), DAB(+), FM analogue including RDS and AM analogue including AMSS. The full feature set of DRM functionality is supported by this device, including Journaline advanced text with full Unicode multi-script support, Slideshow images, EWF, transparent file transmissions (e.g. for educational services, when combined with the power of the full integrated Android based tablet), EPG/SPI, service logo download, etc. 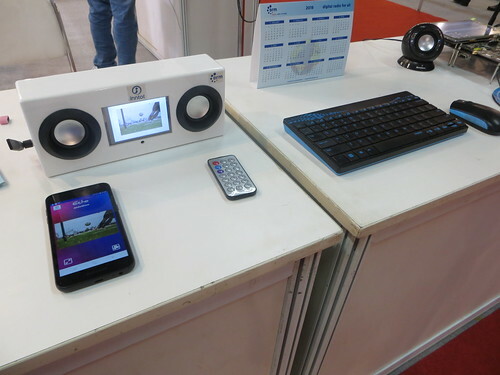 In addition, the model features a Wi-Fi hotspot feature, which allows all Wi-Fi enabled mobile devices to connect to the Titus and receive all the DRM services including audio streaming and Journaline using their standard web browser. The Titus receiver was showcased at the IBC Exhibition in Amsterdam, at HFCC meetings, and at the recent DRM General Assembly 2018 in Palma de Mallorca. The company is offering an innovative OEM model for production in interested markets using local expertise and manpower – another excellent open solution ideal for joint ventures. 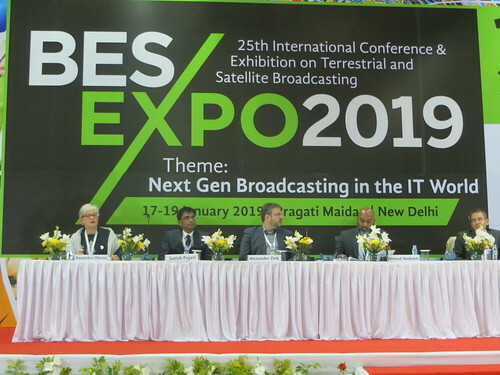 As can be seen above, a lot has been achieved in India recently and the stage is well set for rolling out fully-fledged digital broadcast services on the terrestrial network in India. AIR has the opportunity now to explore the full potential of DRM digital broadcasts so that radio listeners see the benefits of digital radio receivers/automobiles. 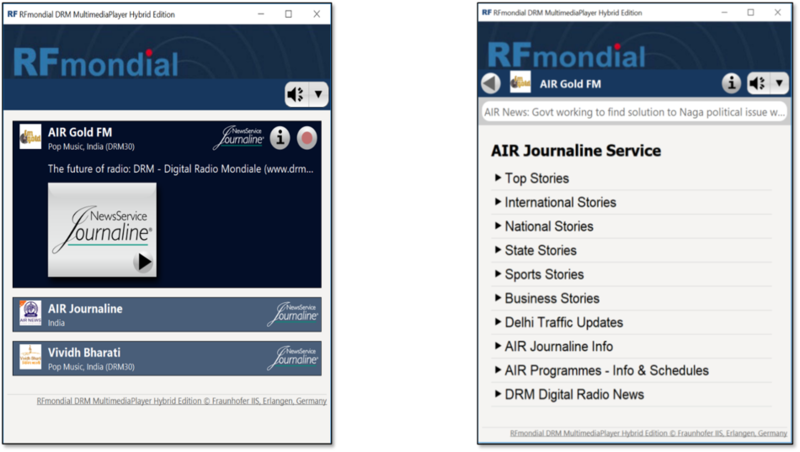 While phase-I of the national DRM roll-out project by AIR was focusing on establishing the transmitter network all over the country (which was successfully concluded last year), phase-II is now concentrating on optimising the DRM coverage and service quality, while also finalising the content offerings with additional audio services and the innovative advanced DRM features such as Journaline advanced text. Those enhanced DRM services with greatly improved coverage and audio quality along with Journaline and service logo transmissions have already been placed on-air in Delhi and Bangalore and are scheduled to be on-air within the next weeks in Pune and Chennai. Step-by-step the remaining DRM transmissions all over the country will then may be upgraded to the full DRM experience as part of phase-II. AIR in Bangalore have added on their website (www.airbengaluru.com) a dedicated section called Listen Live. 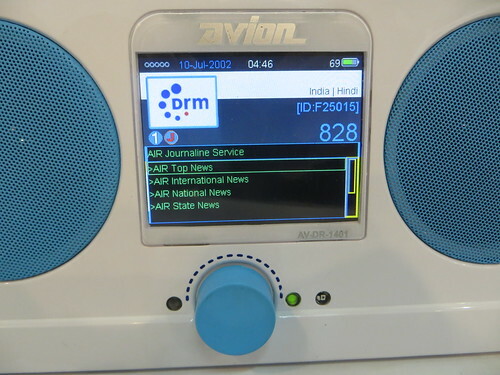 DRM features there prominently under the heading: ‘DRM Digital Radio Bengaluru’. Both best known AIR programmes, Vividh Bharati and AIR Gold FM can be accessed and listened to. In addition, Journaline advanced text is also accessible on that site. The AIR Bengaluru site can be accessed easily on any type of device, including smartphones. Here is an example of some of the AIR Bengaluru on air with current DRM programmes. i. Provide popular programmes in excellent digital audio quality. iii. Provide traffic information, Emergency Warning Functionality, logo transmissions, etc. iv. Take private FM broadcasters on board on AIR’s DRM national network in the MW band and provide them with either time slots or with one exclusive channel (out of the up to 3 channels are now available in pure DRM from one transmitter). Since AIR DRM transmitters can cover an area of over 60% of the country when operated in pure DRM, listeners in these areas would be able to receive programmes of private broadcasters too, which so far have not been available on FM with its limited coverage area. Listeners in these areas would therefore be motivated to buy DRM receivers. This would create a quick popularity of DRM services, as seen in the case of the introduction of FM India. v. All this needs an extensive public awareness campaign including demonstrations of digital services in Community Centres, Railway Stations, Airports and other public places. vi. 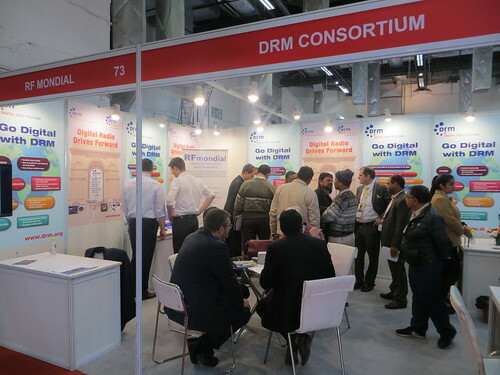 Programmes on the DRM digital radio platform are already bringing new content to many areas in India, in which they could previously not be received over any radio platform (neither AM nor FM). AIR should identify these areas and start a public awareness campaign in these specific areas. vii. AIR should start DRM digital services on the two 100 kW SW transmitters under installation/testing in Delhi. One was tested recently proving the commitment of AIR to fulfill the assurance made by the Ministry of Information and Broadcasting to the Indian Parliament and mentioned in the report of the Ministry for 2017 under ‘Major Achievement of the Ministry’ that two new shortwave solid state digital transmitters of 100 kW to broadcast the border for Afghanistan-Pakistan region. viii. As already mentioned, stakeholders are encouraging the government to consider giving incentives to the private broadcasters to start DRM services and to the domestic DRM receiver manufacturers so that standalone DRM receivers are available in ever increasing numbers at affordable prices. ix. As the Telecom Regulatory Authority of India (TRAI), the regulator for broadcasting also, has already made its recommendation on the digitisation of FM, the major Indian stakeholders are expecting the Government to frame a policy for digitisation of VHF band and announce it urgently so that there is no uncertainty or confusion among major stakeholders and that the full ecosystem for digital broadcasts can continue to be developed smoothly. x. With so much progress having been made in India, there is increasing pressure for the finalisation of phase-II of the DRM roll-out by AIR, and the public announcement of a clear roadmap towards the official launch date of digital radio services (coverage and services/features) in India; this public announcement is both needed by all the broadcasters, the radio receiver industry as well as by listeners.